On May 20th, 2011, Canada Post began issuing a new stamp in its ‘Signs of the Zodiac’ series. This month represents Gemini, or the Twins. 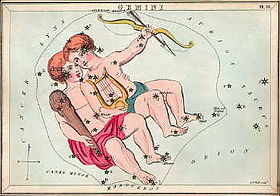 The constellation of Gemini can be viewed best in the night sky during the months of January and February, but in May you can also see it after sunset. 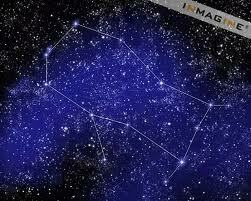 The two brightest stars of the constellation are named Castor and Pollux (or Polydeuces). The story of the Gemini constellation has its roots in Greek mythology. According to the account, the mortal woman Leda was impregnated by her husband and also by the god Zeus. She gave birth to twins with two different fathers, one who was a god and the other human. One twin, Castor, was therefore mortal and the other, Pollux, was immortal. The twins shared in many adventures and exploits, but the most notable ended with Castor being fatally wounded. Pollux then begged his father Zeus to spare the life of his brother. The solution: Zeus granted half of Pollux’s immortality to his dying brother and transformed them into the constellation which bears their name. The twins would have to spend half their time between Mt. Olympus and Hades, half and half between dark and light, night and day. However, at least they would be together. The two brightest stars in the Gemini constellation represent the twin’s heads.